To cut through the hearty flavors of winter, I turn to my pantry. In the summer I put up all kinds of preserves and pickles, which I am so grateful for in the winter. On a chilly, sunny winter day it’s nice to add some brightness to a simple snack or supper of cheese, bread, and cured meat with some simple pickles. If you don’t have some waiting for you in the larder, these are a quick fix! And they’re quite versatile. Feel free to use this technique with carrots or beets, too. You can always adjust the spices to what you like. Here, I used fennel seeds to give the bright, fresh fennel another, earthy dimension. But you could also use allspice, chili flakes, or juniper berries. Play around with the flavors and enjoy this winter pick-me-up! In a small saucepan combine vinegar, water, salt, sugar, and spices and bring to a low boil. 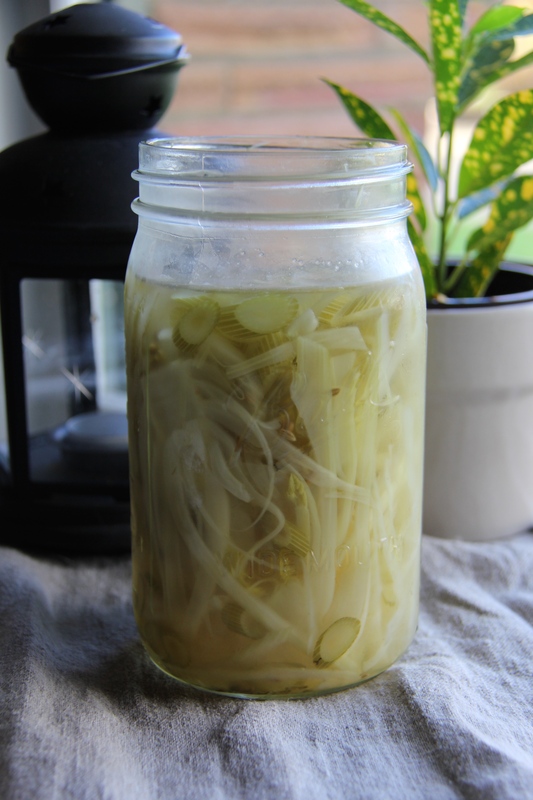 Place fennel in a quart sized mason jar. Turn off heat and pour mixture over fennel. Place in refrigerator and allow to cool overnight.